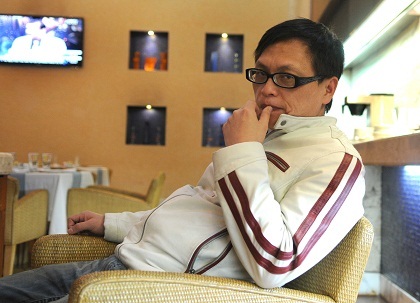 AS FILMMAKER Wang Yu-Lin tucked into his chicken sandwiches at the Vasant Continental hotel in New Delhi recently, he seemed to relish our conversation on Taiwanese cinema. The director was in the city to be a part of the Delhi International Arts Festival’s “Taiwan Focus: Iffi Kaleidoscope” which puts the spotlight on six films from Taiwan, including Seven Days in Heaven, co-directed by Yu-Lin. The two films to be screened on Sunday are: Lin Chih-Ju’s The Wall, a story of love and betrayal of ordinary people during a politically volatile Taiwan of the 1950s, and Leon Dai’s Can’t Live Without You, which is based on real life characters and tells the story of a father and his seven-year-old daughter painfully separated by red-tapism. At the hotel, I was joined by Joy Yen of the TECC and Zhan Ting-Yi, Seven Days in Heaven’s producer, who chipped in at intervals as Yu-Lin mostly talked in Taiwanese. There were frequent pauses and much of what Yu-Lin said, I sensed, kept getting lost in translation. But the filmmaker surprised me towards the end of the hour-long interview when he burst into fluent English, leaving me wondering why he needed a translator by his side at all. A rather succinct synopsis of Seven Days in Heaven, highlighted in the release Joy hands over to me before we settle down for the interview, reads: “A carnival-like funeral. After much tears and laughters. Finding the strength to rebuild the spirit.” The screen adaptation of a prize-winning short story by Taipei-based author Essay Liu, who also co-directs the film, Seven Days in Heaven is a dark comedy-drama on the funerary customs of Taiwan. Starring Wang Li-wen, Wu Peng-fong, Chen Cha-shiang and Tai Bo, it is the story of Mei, a young urban girl who returns to her village in central Taiwan for her father’s funeral. The film tracks how Mei, with her brother Da-zhi, is thrown into a cesspool of strangely obtuse customs which are part of the traditional seven-day mourning ritual in rural Taiwan. Joining them in their hour of grief are a hilarious Daoist priest, a professional “weeper” and a camcorder-wielding young fellow who goes on an overdrive, capturing every detail. They ensure that the funeral is not without its moments of fun. And some fun it is! After the funeral, however, the girl has got to “seal the sorrow of her loss” and return to the rhythm of her life in a metropolis. Pain becomes the occasional episode in the general drama of the pursuit of happiness. Mei has to move on with her life. We all do. According to Yu-Lin, the film broaches the “taboo topic” of death in rural Taiwan in a rather humorous way. Sorrow mingles with laughter, anguish with introspection. The superficiality of old customs runs parallel with the sense of consequential loss. “It’s a black comedy rooted in Taiwanese local tradition. It also gives a glimpse into the characteristic hospitality that is part of the Taiwanese countryside,” he said. Yu-Lin’s other concern was to show the inherent niceness of the village folks. “People should be nice and polite. The film is more personal and artistic than dramatic,” he said, adding that it had the potential to make people laugh and cry at the same time. “Everyone can find an emotional connect. Everyone can think it is his/her story. Death is universal,” he said. Seven Days in Heaven, said Yu-Lin, has a serious subject. But it doesn’t deal with it in a serious way. He said the film’s music — from Hava Nagila, a Jewish wedding song, to American and Spanish pop — will find connect with people across the globe. “Music doesn’t have boundaries of natioanlities. It is an important protocol in a film,” he said, adding he might have a bit of Indian music in his next film. WE MOVE on to the evolution of cinema in Taiwan. It has been a long journey for cinema in the country since the first Taiwan-produced motion picture was released in February 1907. The watershed moments in the history of cinema in Taiwan that, in many ways, marked the beginning of a modern era in filmmaking in the country, were two “anthology-style” films: In Our Time, the four-part 1982 film co-directed by Chang Yi, Ko I-chen, Tao Te-chen and Edward Yang, and Sandwich Man, the three-part 1983 film, based on Huang Chun-ming short stories and co-directed by Hou Hsiao-hsien, Tseng Chuang-hsiang and Wan Jen. These films, along with much that came out later in the ’80s, were rooted in realism and drew on the dramatic changes in society. They were part of the New Wave Cinema in Taiwan which made the world sit up and take note of its cinematic trends. International appreciation and acclaim only helped the cause of sensible and meaningful cinema in the country where yet another kind of cinematic revolution was underway. It was a revolution that saw the craft of filmmaking go hand in hand with commerce. That revolution was in the form of Ang Lee who redefined the landscape of Taiwanese cinema in his first feature film, Pushing Hands, which was released in 1992. It captured the conflict between the traditional Chinese ideas of “Confucian relationships” and Western notion of individualism through the story of an elderly Chinese tai chi chuan teacher, who leaves Beijing to live with his son, daughter-in-law and grandson in New York City and finds himself painfully distanced from the daily rhythms of their lives. Lee went on to make his mark as a Mandarin-language filmmaker with Crouching Tiger, Hidden Dragon (2000) which got its due recognition and reached the world audience after it won the Academy Award for Best Foreign Language Film. Other filmmakers of the period who have redefined the celluloid scene in Taiwan are: Chen Kuo-fu (School Girl, Treasure Island, The Peony Pavilion and The Personals), Hsu Hsiao-ming (Heartbreak Island, Homesick Eyes), Lin Cheng-sheng (A Drifting Life and Murmur of Youth) and Chang Tso-chi (Soul of a Demon, The Best of Times, Darkness and Light and When Love Comes). Yu-Lin described the current stage of cinema in Taiwan as “New New Wave”. He says the new wave films were not very successful as they didn’t focus on market. In the last one decade, cinema in Taiwan has seen further flourishing as young and innovative filmmakers, like Niu Chen-zer (What Have I Done Wrong? ), Tom Shu-yu Lin (Winds of September) and Yang Ya-che (Orz Boyz), who have introduced newer forms, methods and styles and won critical acclaim around the world. According to Yu-Lin, another refreshing era in Taiwanese cinema began with Cape No 7 (2008), a romantic drama suffused with humour, written and directed by Wei Te-Sheng which brought the audience to theatres. Yu-Lin said after Cape No 7, more and more filmmakers are focusing on style and narrative. And it was style and narrative that was on Yu-Lin’s mind when he was shooting Seven Days in Heaven (the entire shooting was done in 16 days flat). “I was always thinking about what sort of images the audience want to see and what will they take back,” he said. Asked about the subjects and themes in the contemporary Taiwanese cinema, Yu-Lin said gangster films, love and coming-of-age stories have failed to find favour. Films on social issues and historical narratives with a slice of nostalgia about the country’s traditional culture get great response. “The Taiwanese audience wants to see their own stories on the celluloid,” he said. A fan of Jim Jarmusch, Wong Kar-wai, Quentin Tarantino and Martin Scorcese, Yu-Lin also loves watching Hindi films and enjoyed Wake Up Sid. “India’s diversity is best captured by its movies,” he said, adding that India had the right talents and the soft power and infrastructure to support the drive of young filmmakers to make different kind of cinema. When it comes to Taiwanese cinema, which has managed to stave off the influence of Hong Kong and Hollywood and is increasingly coming into its own, there is a larger narrative of cinematic excellence waiting to unfold. And filmmakers like Yu-Lin are like the rising stars who will write that narrative in times to come. The world is all eyes.